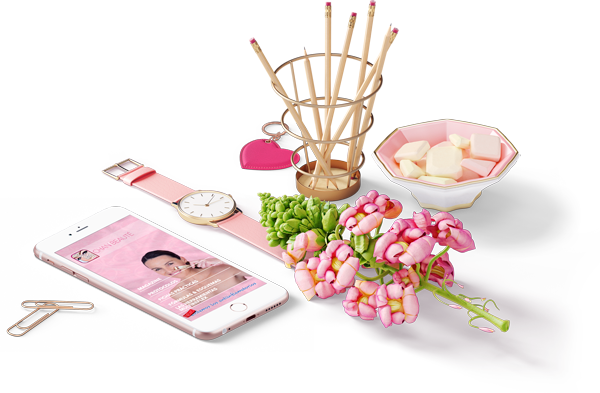 The Chan'beauté app: therapeutic aesthetic technique. Ancient chronicles reveal that of all the women at the court of the Forbidden City; all the Princesses and concubines, only the Empress had the right to receive a unique massage to ensure her beauty. 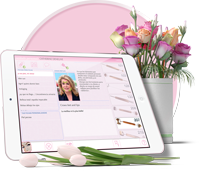 For beauticians and therapists alike, by teaching your clients the simple gestures and offering multireflex tools to work on themselves you demonstrate the value of your service and talent well beyond the information that anyone can search on the internet. 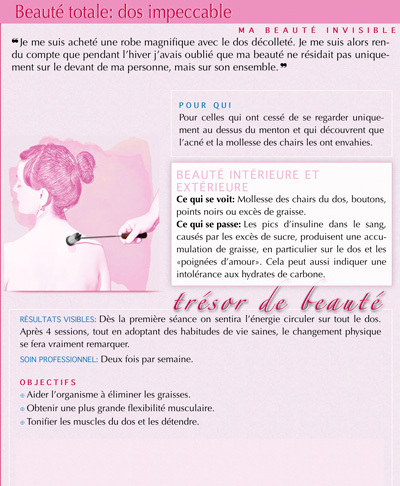 ★ The full protocol for the Secret of the Empress and many others are in the Chan'beauté magazine. The guarantee of seriousness and authenticity. The International School of Multireflexology – Dien Chan (EiMDC) has been teaching in numerous countries since 2002. And our certified teachers are not isolated; they fully and continually participate with the EiMDC research teams, upgrading their knowledge. That, along with our numerous publications, is a guarantee of the most up to date training available. The complete team and their curriculum vitæ are here. The iPad version also works on your iPhone, no matter the model. 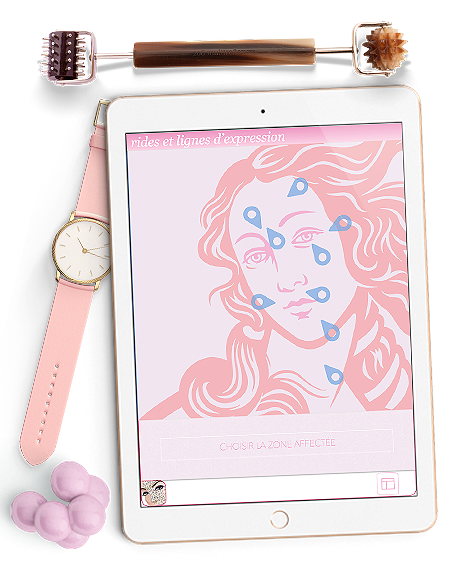 Instead of using your data to consult time-consuming networks on the bus, subway or plane, enjoy the interactive Chan'beauté magazine that doesn't need an internet connection to reach all its content. The magazine is much more than just a student course support. The only interactive magazine, for iPhone and iPad. Our students benefit from our knowledgeable and experienced teachers who share all the information and resources available. For the past two years, working with our very active team of researchers, our students questions and everyone's shared experiences, we now proudly offer a wonderful, completely informative publication: the Chan'beauté magazine. 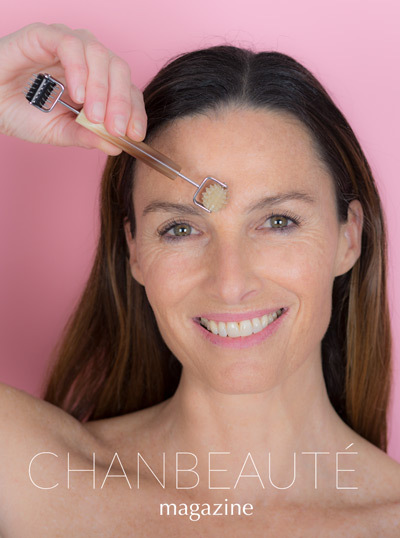 With our many years of therapist work and teaching in many countries we offer, in great detail, many topics as well as the application of the Chan'beauté techniques. It is now much easier for students to study and understand the concepts of this multireflexology modality. 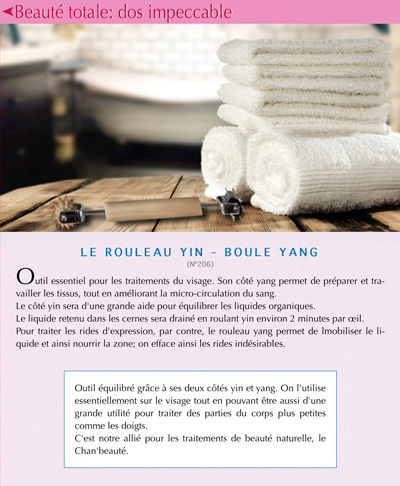 Born from Multireflexology – Dien Chan, Chan'beauté offers aesthetic treatments with a therapeutic dimension. Our philosophy is totally the opposite to that of the beauty industry. Theirs: Use of machines, surgery and other invasive procedures, such as injectables that ultimately are only effective because of their toxicity and only enhance a youthful appearance, temporarily. 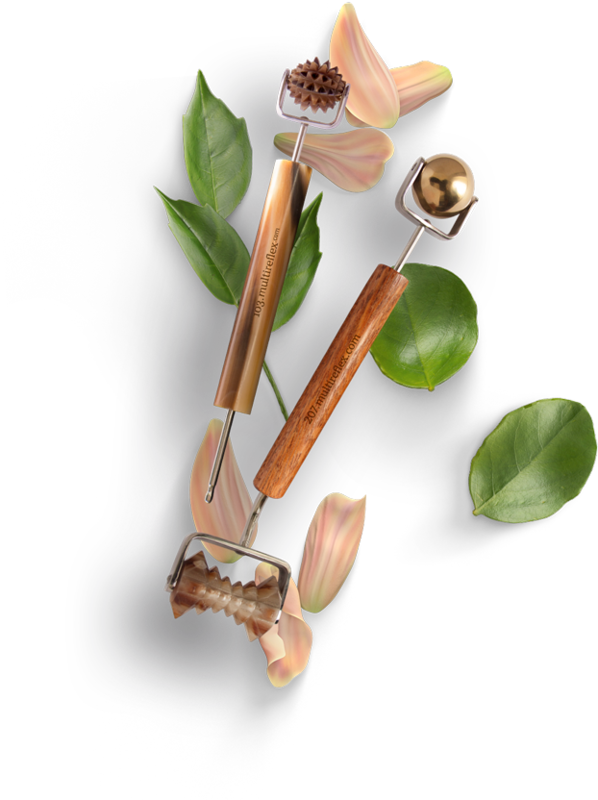 Ours: A non-invasive, modern, cutting-edge technique using simple, natural hand tools to bring out your natural beauty - literally! No knives! No needles! And remember the secret - Inner harmony = Outer beauty! The trend today is for relaxing, natural care and many Wellness professionals and Spas have asked us for advice on how to integrate the therapeutic aspects of Chan'beauté into their aesthetic treatments. Thanks to simple common sense techniques your talent achieves the best results in a natural way without toxins or aggressive procedures (no need for expensive machines or magical creams) and adds a therapeutic dimension to your treatments. In fact, boosted by your delicate stimulations, the active ingredients of a quality, natural cream, applied at the end of a Chan'beauté treatment, means using less product. It's a magazine, with a twist! Now is the time to check out the installation page and begin your personal exploration of the Chan'beauté magazine. 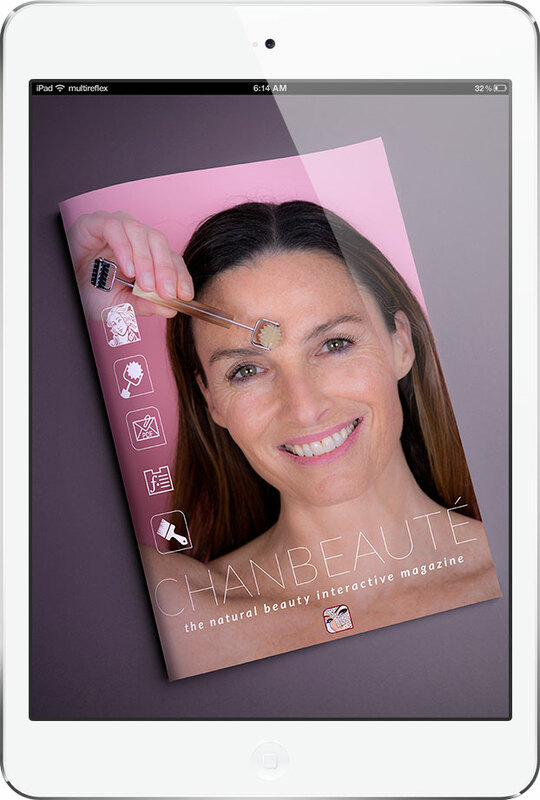 Whatever your device, the Chan’beauté interactive magazine is perfect. 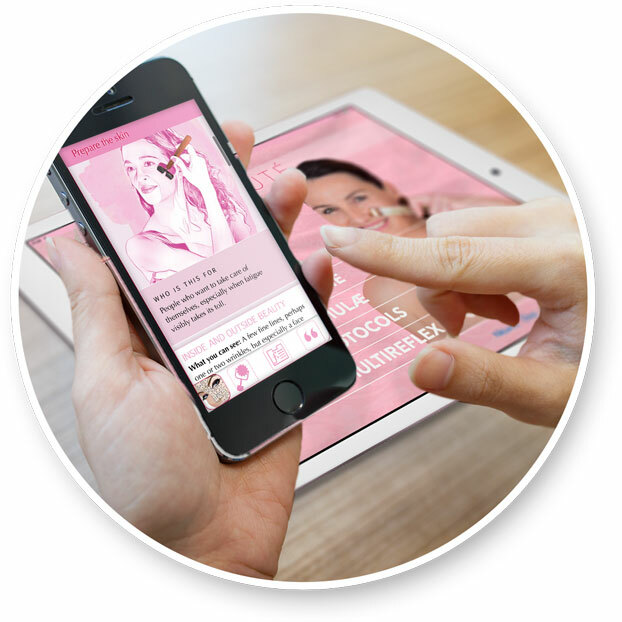 FileMaker Go, because of it's versatility is the Application we use as the newsstand for the Chan'beauté magazine and other Multireflexology – Dien Chan Apps - and it's free! But only for iPad's and iPhone's. FileMaker Pro (professional software for App developers) is available for Mac or PC, but it's not cost effective for this use; a real shame! 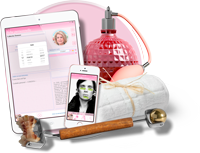 Check out the installation page and begin your personal exploration of the Chan'beauté magazine. Instead of being bored on a plane, traveling to work on the bus or a train - in fact anywhere! With your iPhone in one hand and your favourite tool in the other, it can be a great opportunity to share your knowledge and make new friends. It's good for your spirit! At the International School of Multireflexology - Dien Chan (EiMDC) we keep everything simple! 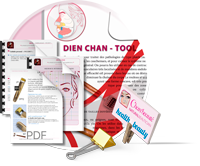 The Chan'beauté magazine (as other educational supports of Dien Chan) uses FileMaker Go to serve as a newsstand. which allows us to offer you a completely interactive and independent magazine that can be updated easily to receive new content as it evolves. And the cherry on top? You don't need an internet connection (cloud-computing) to save the practical treatments and personalized care that you create for your clients. They're all contained within Filemaker Go. This is truly an independent, interactive magazine! The installation page! 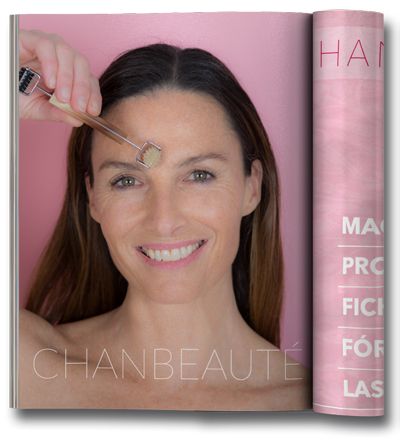 Begin your personal exploration of the Chan'beauté magazine. To produce a traditional magazine, published in several languages, would be an astronomical price and use a great deal of paper so… What if we save the trees by taking advantage of state-of-art technology? An adaptable interactive magazine for self-treatment and professional work. Chan’beauté! A superior quality interactive magazine - at the best price. There are so many protocols, practical treatments, tips and informative articles... With your iPhone you will always have them with you. 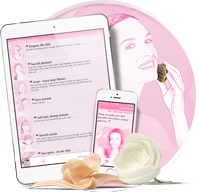 Within a few minutes the Chan’beauté magazine is loaded - ready for you to explore, consult and use. Download the 'demo to see what's available and then be sure to choose the right version for you and make your purchase directly from the Chan'beauté magazine. ChanBeauté'demo; with features that will help you decide which version you want. Purchase your chosen version from the magazine, using your preferred currency. 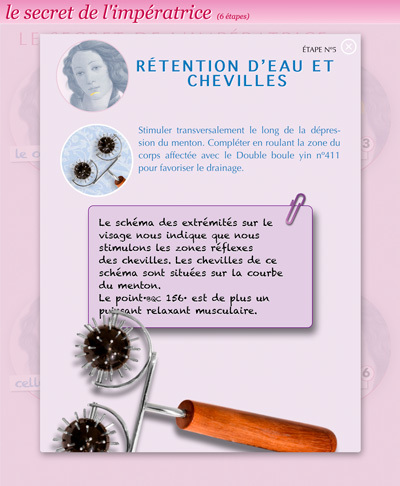 ChanBeauté'clinic: for iPad and iPhone. 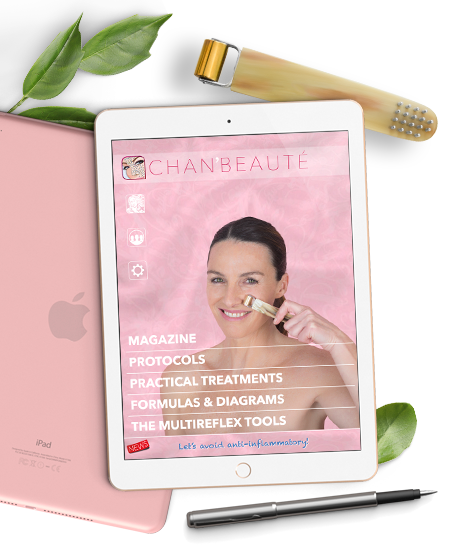 ChanBeauté'pro: for iPad and iPhone. Because each person is unique in this world; every clients' care is personalized. 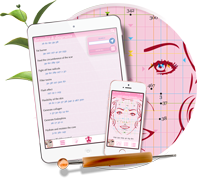 Using this section you can develop personalized treatments of protocols, formulas and tips, and along with diagrams of the facial or body areas to be worked, put them in a single PDF and email it to your client as homework (mini-treatments they should do at home to consolidate their therapy). 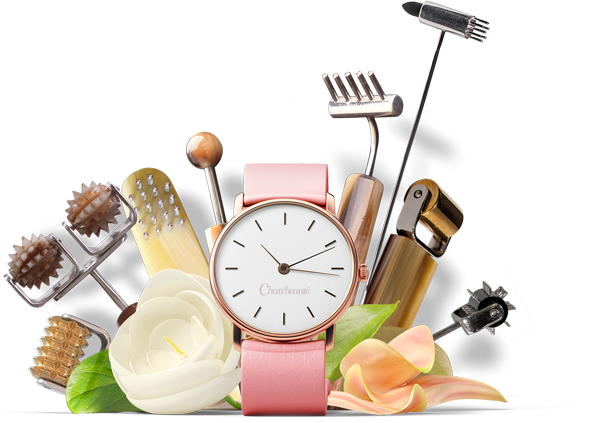 You can also select the most appropriate tool that your client can purchase either from you or from the DienShop. And best of all, you can draw on a diagram, within the program, to show the exact area's for homework - Or better yet! Your iPad has a camera, so why not draw on your clients' personal photo? Access appointments, your client list and create a client file. Record personal observations and comments. Send emails with the PDF treatment summary, diagrams and homework. 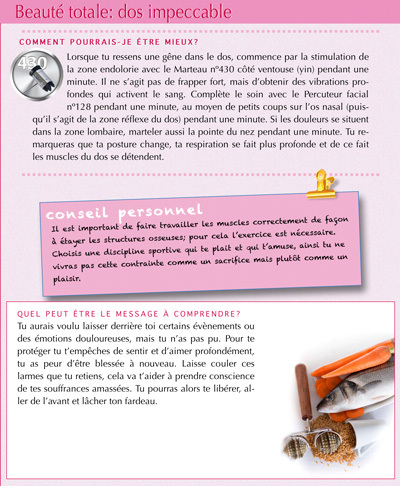 ...There is an integrated user-guide in the magazine to help you! Add your personal therapist information; name, contact information, logo etc., and all the other information you want, to produce impeccable PDF's. Set up your preferred language, control your Chan'beauté licence management and contact the school. 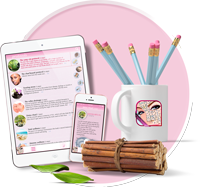 This interactive magazine has been developed with a great deal of passion and love. We hope you enjoy it. Except for accessing the user manual, receiving updates, news items, or ordering the multireflex tools, the magazine is 'stand alone', so does not require a constant WiFi connection. It is available for all models of the iPad and iPhone. However the iPad version will work on your iPhone, but not the other way around. (Sorry!! FileMaker, the engine for the magazine, whilst free for iPad and iPhone, is only available for Mac and PC users at a substantial fee - making it very cost-ineffective). All the content is available in English, Spanish and French. Start taking the reins of your beauty, your health and that of your clients right now! Optimize beauty routines to take full advantage of the active ingredients in natural, good quality face creams. Carefully study the list of features available in the ChanBeauté'pro version (limited) versus the ChanBeauté'clinic, (full), to avoid the need to purchase the full version later. Even if you don't use all of the 'clinic options, it is the better value. 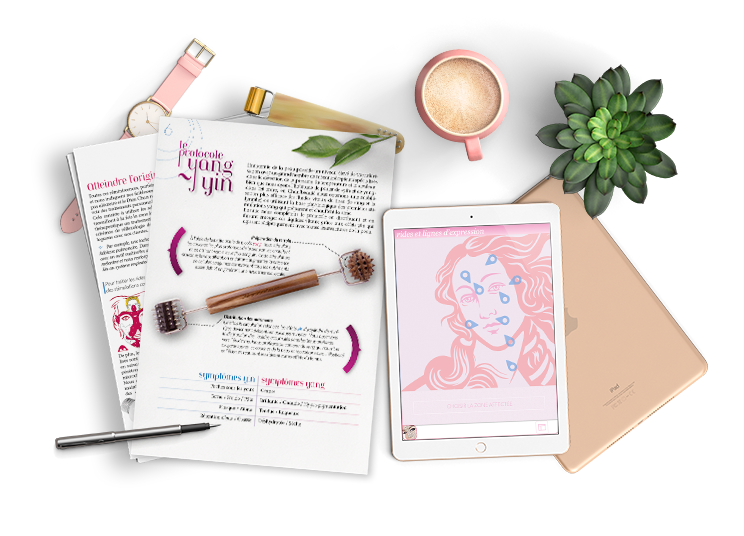 As we were building this new magazine, we asked beauticians and therapists, as well as our students, for their comments. 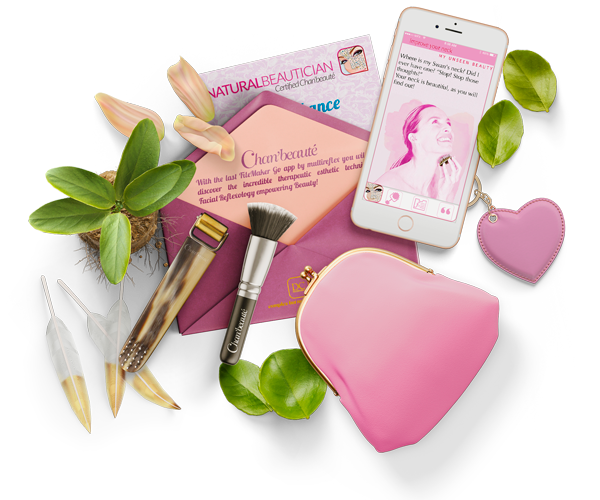 Here they share their first impressions of Chan'beauté. “I could not imagine all that this interactive magazine could do. I am pleasantly surprised! 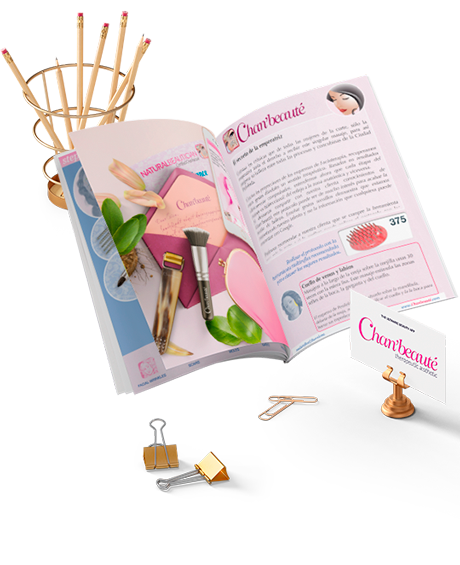 “I discovered the strength of Chan'beauté thanks to this application. It's excellent! Beauty is the expression of your good health! A Dien Chan - Multireflex production, Barcelona. C H A N · B E A U TÉ ✤ Original idea and coding: Patryck Aguilar Cassarà. Technical contents: Angela Liste Juncal, Anna Roca Carrasco, Montse García Pallarols, Vicky Jimenez Abad, Marie-France Pierre, Phiane Nhotpasa, Erica Layton, Patryck Aguilar Cassarà. Redaction: Esther Solsona de la Serna, Patryck Aguilar Cassarà. Translation and editing: Gillian M. Jones, Béatrice Aguilar, Andréa & Joseph Aguilar, Esther Solsona de la Serna, Patryck Aguilar Cassarà. Photography and communication, Felipe Tobón, Analia Lopez, Béatrice Aguilar, John-Jairo Tobón. Design and art direction: Patryck Aguilar Cassarà. Videos: Eloi Costilludo, Aïda Gil, Felipe Tobón. Special thanks: Javier Felipe, Pedro Laborda, Paula Bravo, Yvan Binggeli, Christine Bretin, Helène Alvanitakis, Hugo Lobato, Carmen García, Martin Charest, Raul Patiño, Juan B. Fernández, Sonia Fishmann, Élizabeth Kubica, Beatrice Moricoli, Vittorio Bergagnini, Michael Weiland, Kevin Bodin, Serge & Marjolaine Goulet, Anne Hilarius-Ford, Gaëtane Aguado, Laure Barthélémy, Alex Perez Sahuquillo, Jacky Senna, Salvatore Perna, Carol de Groot, Vanessa Margo, Rocio Rodriguez, John-Jairo Tobón, Pierre-Louis Exertier, Orely LePort, Ekaterina Rameeva, Regla de 3 :: Barcelona, SetFile (FileMaker), Filemaker Pro | FileMakerGo, Mari Lou (HTML+CSS), Lea Verou (CSS), Tim Dietrich (Easycanvas), Steve Johnson (Literally canvas), Claudia Romano (HTML+CSS), Freepik - Ruslan Latypov, Adobe Systems, Apple computer, Google & All the EiMDC students. A Multireflex s.l. ~ Barcelona production.